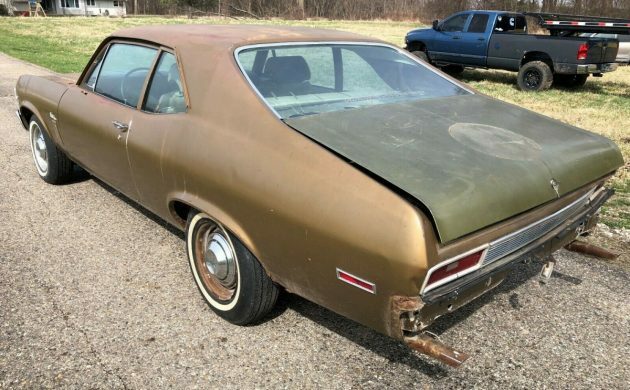 The seller refers to this 1970 Chevrolet Nova SS as a real barn find. It was driven to northern Indiana from Oklahoma in 1988 and hasn’t been on the road since then. 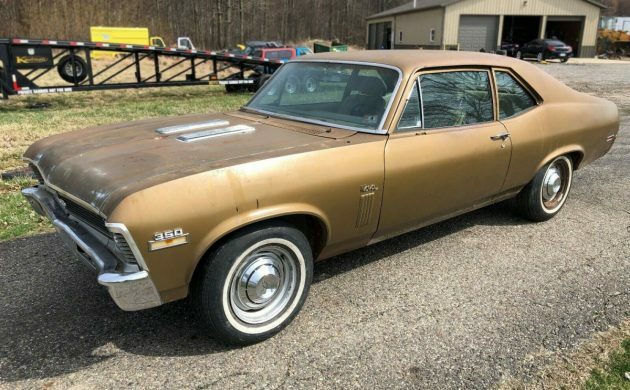 This Nova SS can be found here on eBay in Mishawaka, Indiana. The current bid price is $4,150 and there is no reserve and 5 days left, how much will this one sell for? This car looks good so far, but if you squint, not too hard, you can see a wrinkled right quarter panel. Unfortunately, it’s really, really wrinkled so the next owner will have to change that one. That would be a lot of panel-pounding and bondo to make that one look like new again. They say that it was crunched sometime before 1988 before driving it up to Indiana. Thankfully, the other side looks good. I’m not sure why the trunk is a different color. There is a fair amount of rust underneath the trunk lid which is scary, at least for someone like me who has lost a few otherwise good cars to rust. On second glance the interior doesn’t look that bad but on first glance, that fabric on the driver’s seat really catches your eye. I used to be worried about interior work before I found a great shop and now I barely give it a second thought. Especially with a car like this where almost everything is available in a catalog. The seats will most likely all come out during the restoration anyway and luckily there are factory-correct covers available. The seats will come out because there’s rust underneath that’ll need to be fixed first. This is Chevy’s L48 small-block 350 cubic-inch V8 with 300 hp and it’s backed up by a Turbo HydraMatic 350 automatic transmission. 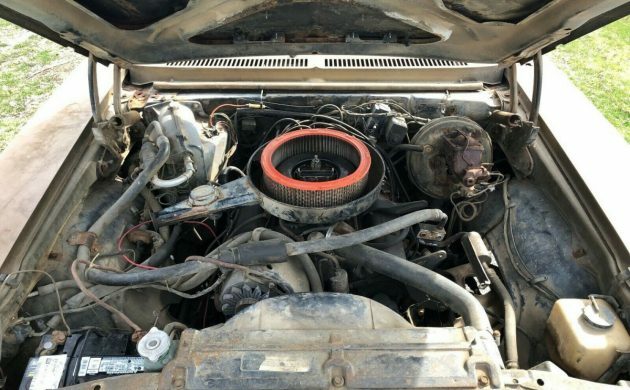 The seller poured gas in the carb and they say that the engine runs good with no knocks but the condition of the gas tank is unknown, so add that to the list. They have a few NOS parts available to the buyer at extra cost. This Nova SS would sure be both a beauty and a beast, will it ever be restored given its current condition? That rear deck lid is a replacement related to the right rear quarter damage. The first photo lifted my spirits and each subsequent photo brought me lower and lower. This one’s not for me but BF has some very talented and knowledgeable readers that might want this one and have no fear about taking it on. Ultimately I suppose that it would depend on how much rust is present. Almost looks like it was parked over a damp earthen floor since 1988. Pretty rare to have factory A/C in a Nova, especially an SS. 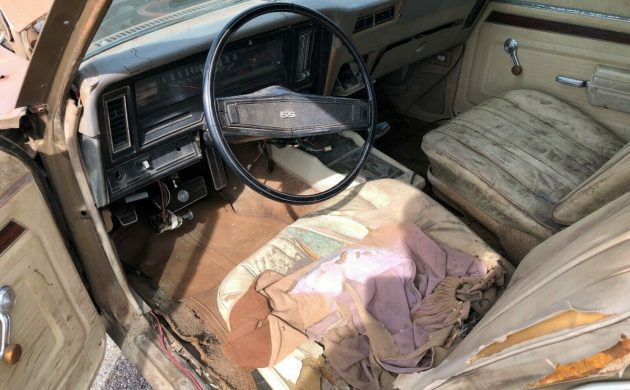 Price on Novas 70-74 are not high enough to support a deep restoration this car needs. I just watched Barrett Jackson and noticed that other than restomods and the early SUV’s (pre 72 Blazers as an example) the prices are coming back to a more reasonable point. I saw a #’s matching 67 R/T sell for 25k where a few years ago it may have gone for 40-50k so there’s hope! 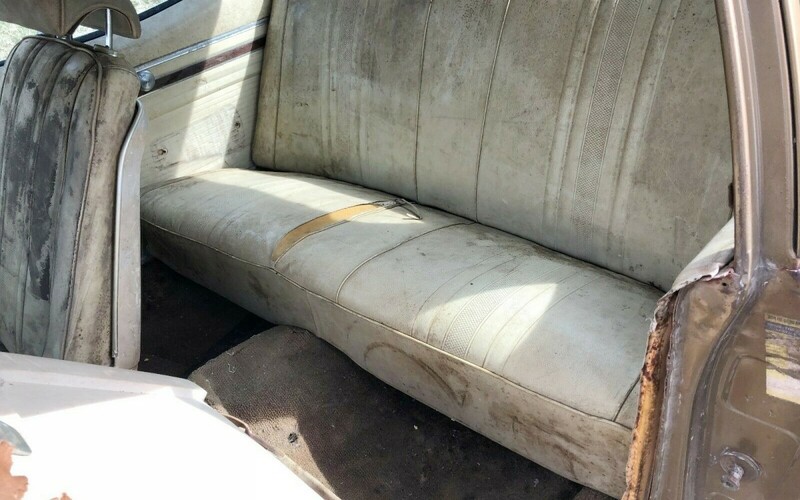 Better put some effort into that interior before it becomes too shabby. Why are there lose fender shims laying on the cowl? 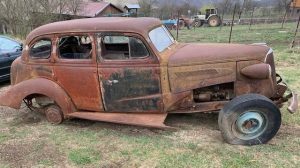 It’s up to 5300 today, It looks like it needs 10 grand spent on it, quarters, full interior, paint job might be 3 to 5 grand…I see rust on the rear of the drivers side rockers….could be a lot more than what meets the eye, AC compressor missing but in the trunk?..well lines are left open since 1988 and as such, ac system has been contaminated. I think if someone can do 100% of their own work, maybe they could get it on the road and only have 10 grand in it. Plus their labor. Could be a deal for the right person. I hope they enjoy it. 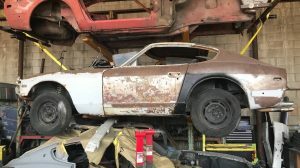 I’ve seen some high priced Novas lately, maybe restored it will be worth the effort. HI Dan, I am being completely cool here, not a jerk so please don’t take my question the wrong way. Where do you live? “10K full resto with $3-5K in paint”. What level of quality on the paint job? Just curious. If you live somewhere where you can get great work done at these prices I might start shipping cars out of Chicagoland and have them done elsewhere. Thanks, Tom. 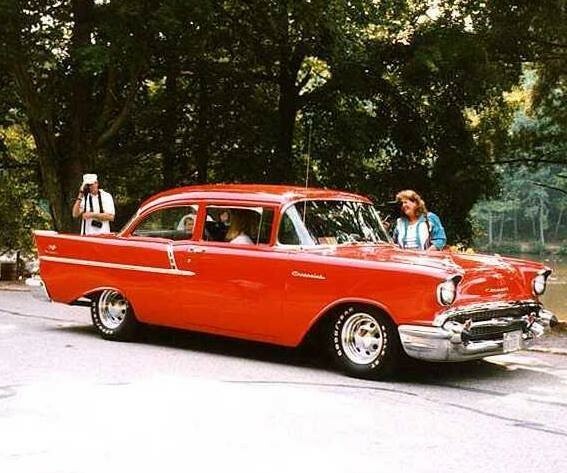 Tom, my thoughts are a guy who can do most of his own work, I’m 70 now and have done most of my own cars back in the day, I had several 55 and 57 Chevys that I did 90% of myself. I live in Danville, Va. where J&W Nova is located. And at time we still have some cars laying around in back yards, I see a nova every once in awhile. 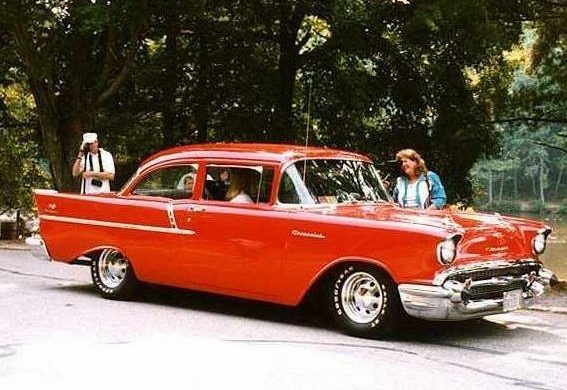 I bought a 57 Chevy in 92 after I built a new garage, (my other one burnt to the ground and I lost a 57 hardtop and also a modifie 55 Truck. ), anyway, I bought a nice in my eyes, 57 Chevy 150 2 door, I replaced all of the windows, rubber seals, wisker strips, buffed all stainless, replce all chrome, all interior was done at a neighbors upholstery shop at a good price, another neighbor owns our local Maaco, he painted it for 250 bucks, his son had 7 years experience at our Ford dealer, and he painted it using Dupont single stage…it looked pretty good after 8 weeks, I replaced the engine and trans, added disc brakes and power steering the next year, all done by myself. I know a show car paint job might be 3 to 5 grand with the cost of materials but, sometimes if you are building a driver, it doesn’t matter as much. I did garner a few 2nd and 3rd place trophys over the 12 years I kept the car, sold it in 2004 for 15grand. I had about 8 grand in it total along with the 3500 price I paid. Hi Dan, thanks for your comments. First, really sorry to hear about your loss of the other cars, that is terrible. I have been restoring cars for about 35 years, first one at 18. 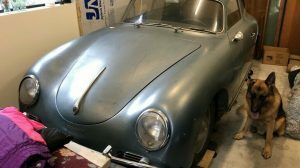 I too do a lot of my own work but for those who don’t, here in Chicagoland, I have not seen many great paint and bodywork jobs by local shops period and we are talking $8-10K spent…. and they are terrible. I have seen decent paint work but over terrible body work = tragedy. A Nice paint and body job here (no mechanicals, no interior, no parts, no suspension etc) just paint and body with a decent body to start you will be north of $10K maybe 15-20K. Outstanding paint work will certainly be more than that. A good bodyman and a couple of correctly angled pulls might help that right rear quarter. No vinyl top is a plus. A/C evaporator, compressor and other parts are available in the aftermarket. But, lots of rust and a rattty interior are negative. Novas of this model are weird. Had both a ’72 and a ’74, and the ’72 was far superior IMO. The ’74 was far slower and didn’t seem to have the “lightness” that the ’72 had. The ’74 drove more like a big, heavy Impala, again IMO. Somebody will want this car for nostalgic or collection completion purposes. What they will pay is the question. New interior and body work is not that difficult. It’s a uni-body and these cars looked like they were out of kilter going down the road even without being hit. You have to get the geometry right, which requires the right guy with the right know how and equipment. At the end of the day, it will be hard finishing with something that is worth what you put into it, if you don’t have the right buyer. Good Luck. Wow, that’s some big money so far for a unibody car with that kind of hit ! 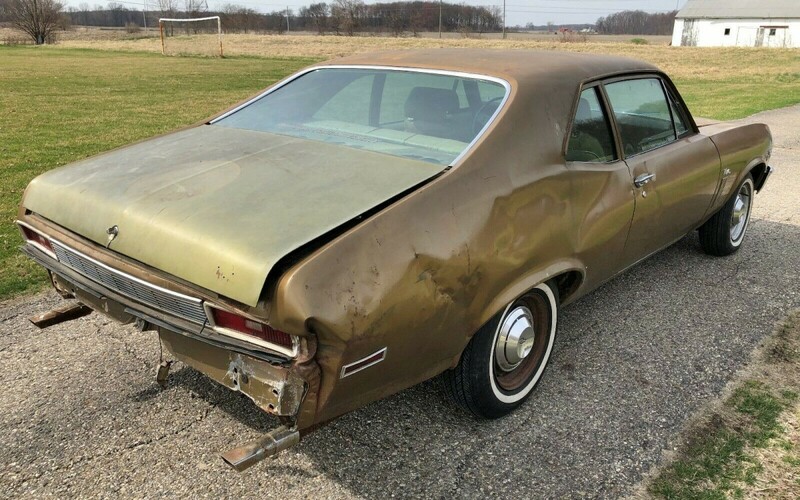 I’m sure some of that dent was beaten out years ago, so I’d really like to see what the trunk floor and spring mounts look like before I’d put a bid on it. At fiirst I thought Scotty had quite the find. But all things considered. No. I wrote off my 68 Nova when I went sideways into a pole with the right rear and it shifted the entire rear end over about a foot. Look closely at the trunk lid, this car is going to need more than just a few pulls. That is big damage. Parts car, and a roach to boot. Yet look at the bids, unreal………. Yeah it hasn’t been driven since ’88. Just like I haven’t moved since ’88. That car has had the dog poo driven out of it. Maybe hadn’t been driven in 88 minutes, since 1988. Really? That car’s rougher than the corn cobs we used in my uncle’s outhouse. I agree this car looks almost as if it was left to languish in a flood. …due to the previous owner being very discouraged of such. You know my thoughts on this car is pretty Iffy without adoubt it’s got potential but to what end. The ravages of rust look doable THAT IS WHAT WE CAN SEE, and that is the part that worries me the most! The fender I would just buy a new one but what’s damaged underneath worries me more. I like the car a lot and Nova prices are climbing every day, I would pass on this one only because of what I can’t see, I would spend a bit more to start with one in better shape. The last thing I need is another BIG PROJECT. A good car for someone with parts and time bring it back,but I would rather have a Mopar with a little rust to it! 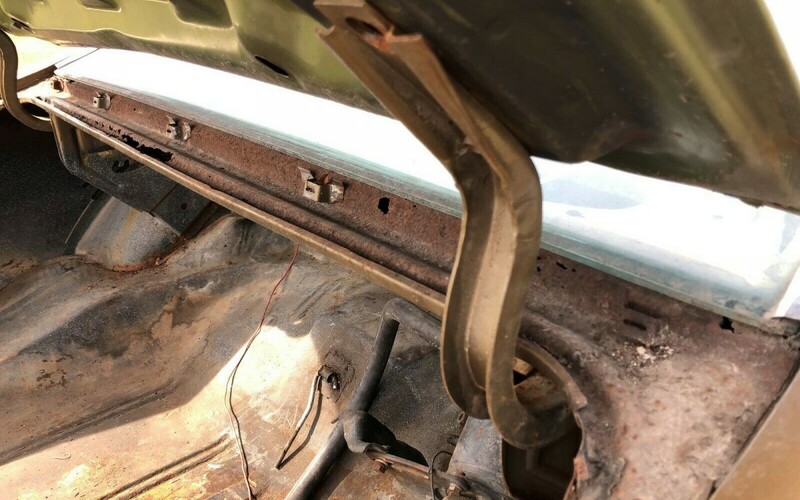 Any vintage Mopar with just ‘…a little rust to it…’ is a rare find. I have seen some pretty high prices on these cars on eBay but, you know how that is, kinda like Mecum auctions, prices are inflated for sure. but, I just saw a 70 SS on Facebook Market Place today for 10 grand. sorta reasonable I think, but, maybe someone will end up with this car and put it in a show or two, get a few trophys, then put it on ebay or take it to an auction and get 40 grand out of it. I know folks who make a living doing that with Novas and Camaros. I’m sure the rest of you know someone like that. Maybe somebody knows more than me, BUT L 48 is not 300 HP. That whole passenger side was hit….to bid on that sight unseen.?????SCARY!! At first I thought this was a great car, especially at the price. But, the further I read, the less I liked it, regardless of its pedigree. This car is going to need a lot of work. But, for the one with the deepest pockets and the right know-how, it just might be worth it. Just not me. Bidding, as of this reading is at $5,900.00. Best of everything to all. I know rust belt folk get excited by this kind of a find but it seems common sense has gone out the window here. 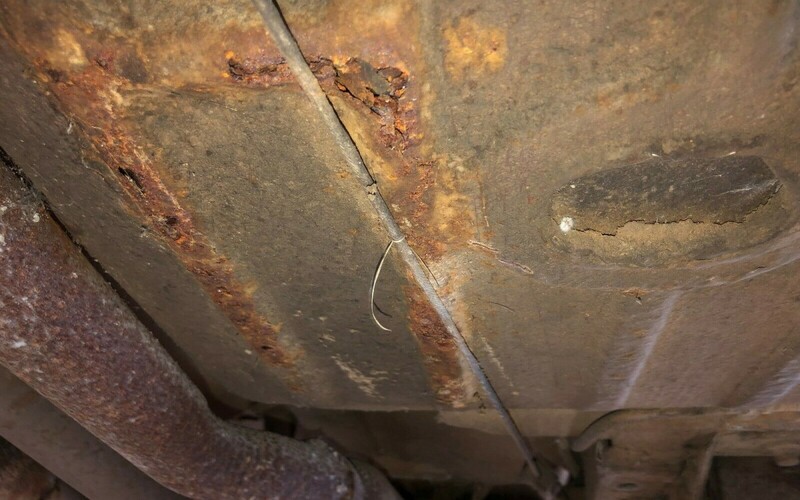 Rust under the trunk sill and into the package tray. Damage to the right 1/4 from the tail light panel all the way up into the roof pillar and the trunk floor. Pass door damaged. The seller posted lots of underneath pic’s but none under of the damaged 1/4. NOS parts not included and it’s at $5900 with 3 days to go..
Here’s a 69 Nova in Vegas built, running, driving offered at $9 grand. 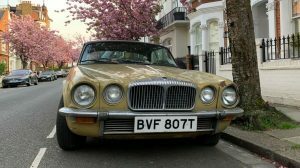 If it’s a western car it’s sure not likely to be a rust bucket, at all. 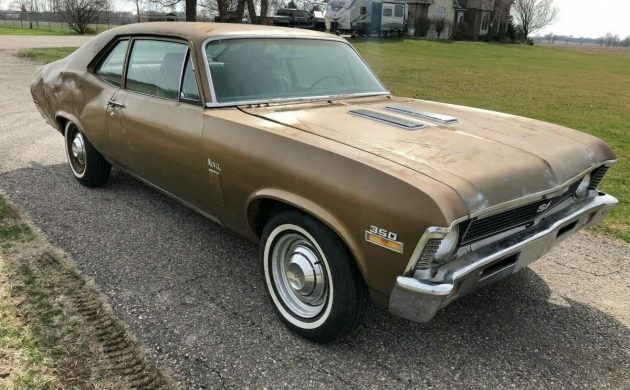 https://offerup.com/item/detail/613186341/ and there’s a rust-free 69 Nova shell in Phoenix offered for $2500. Oop’s, their not SS cars, boo hoo. Lets overpay 2X for a big project every body shop operator is going to grimace at when they see it, in order to have an “SS Nova”. Unreal for certain. that Nova for 9k on the link looks decent..appears a good chunk of the 9k is the powerplant? Somebody put a wrinkle in it’s dinkle. Other than that it’s nine years worth of work to beat it into shape. It could have been in a flood or it is from the Gulf Coast. You can pull the 10-bolt cover to find out if it was underwater. Judging from the protective coating of crud on the rear end it looks like it hasn’t seen light of day since 1970. Those bucket seats and the button top floor shifter reminds me of a 1966 Nova SS. The L-48 and ZQ3 both hit the 300 horsepower mark. (Motor Trend https://www.motortrend.com/news/small-block-chevy-v8-through-the-years/). I have no clue about the poverty caps. The interior is doing a great job impersonating a gas station men’s room. The glasspacks scream Oklahoma and the A/C in the trunk… well that screams Oklahoma as well. RULES: No profanity, politics, or personal attacks. Don't post your car for sale in the comments. Click here to get it featured on the homepage instead. Attach Image (Allowed file types: jpg, gif, maximum file size: 8MB. Notify me of new comments via email. Or subscribe without commenting.